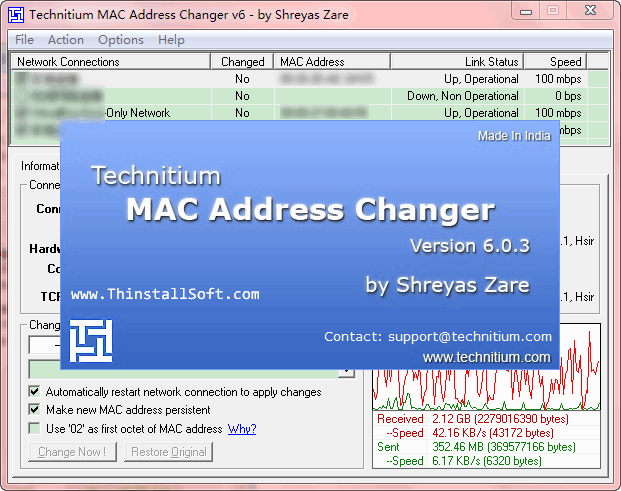 Technitium MAC Address Changer is a powerful MAC address manager of the network adapter. You can use Technitium MAC Address Changer to easily change MAC address of all the network connections with preset Mac address or random MAC address. You can also delete damaged Network Adapter entry from Registry. Run TMAC.exe to launch Technitium MAC Address Changer Portable. The current version is Technitium MAC Address Changer 6.0.3. * Internet Protocol v6 (IPv6) support added. * Works on Windows 7 and Windows 8 (Developer Preview) for both 32-bit and 64-bit. * Automatic Update feature added to update software to latest available version. * Update network card vendors list feature allows you to download latest vendor data (OUI) from IEEE.org. * Enhanced network configuration presets with IPv6 support allow you to quickly switch between network configurations. * Command line options with entire software functionality available. You can select a preset from specified preset file to apply directly. This entry was posted in System Utilities and tagged mac address, mac address generator, network connection, technitium mac address changer. Bookmark the permalink.